No cocktail party is complete without bourbon - it's a delicious addition to a refreshing array of tantalizing beverages. When choosing the best bourbon brand for each drink, look at the color. Light bourbons accompany fruity ingredients while dark bourbons add robust flavor. Check out Sally's Place spirits guide for more information about what makes liquors unique. These ten recipes are sure to please you and your guests alike! Designed for bourbon lovers, this drink is similar to a whiskey sour. Stir the honey and water until the honey is dissolved. Muddle with the orange slices then add enough ice to fill the shaker, lemon juice, and bourbon. Shake well before straining the liquid into a glass. Garnish with the orange wheel. Stay as cool as a cucumber with this refreshing cocktail. Muddle the cucumber and simple syrup before adding bourbon, lemon and lime juices and enough ice to fill a highball glass. Shake well then top with ginger ale and the cucumber spear. Named for Adam Sandler's character in the film "The Waterboy" this cocktail will be classier than a sports drink, but mighty refreshing. Combine the cherry liqueur, bourbon, Benedictine and sweet vermouth then pour it over ice. Strain it into a coupe before adding the garnish. Sweet and sassy, just like sweet tea - but for grownups. Prepare the tea with 2 cups water. Steep for 8 minutes. Add 2 cups cold water and lemonade. Chill then add basil, bourbon and honey. We bet you'll like this drink. 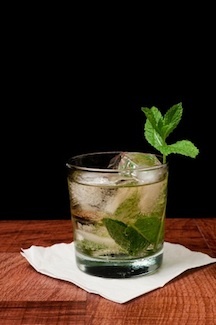 Muddle the mint leaves, turbinado sugar and club soda. Add, bourbon, Frangelico, pineapple juice and pure maple syrup, then shake. Double strain the liquid, and garnish. Use dark bourbon for large flavor. Muddle the raspberries, mint leaves, lime wedges and honey syrup. Add bourbon and cranberry juice. Shake, strain and garnish. This drink originated in The Oakroom in Louisville, Kentucky, where Al Capone played poker in the 1920s. Muddle 3 basil leaves, vinegar and simple syrup. Add bourbon and shake well. Strain it before stirring in the ginger ale and garnish. Jazz singer Dinah Shore’s career and this drink launched from the same Nashville hotel bar. Over ice, pour bourbon, iced tea and triple sec. Stir then garnish with mint and lemon. It's a mint julep with a twist! Muddle the mint, lime juice and simple syrup. Add bourbon and club soda. Swizzle slightly then garnish with mint and lime. Combine these traditional Southern ingredients for big taste. Muddle mint leaves, 2 lemon slices, 3 cherries and simple syrup. Add bourbon, cherry liqueur, tea and lemon juice. Shake then garnish with the mint, lemon slice and cherry.